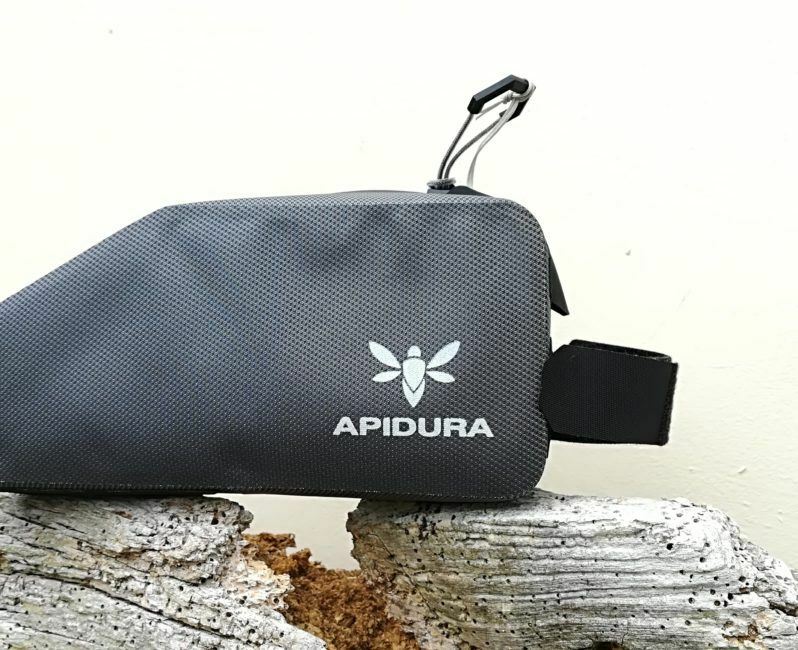 First Look - The New Apidura Expedition Top Tube Bag 1L - ADVNTR. We have just taken delivery of the new Expedition top tube bag from Apidura. 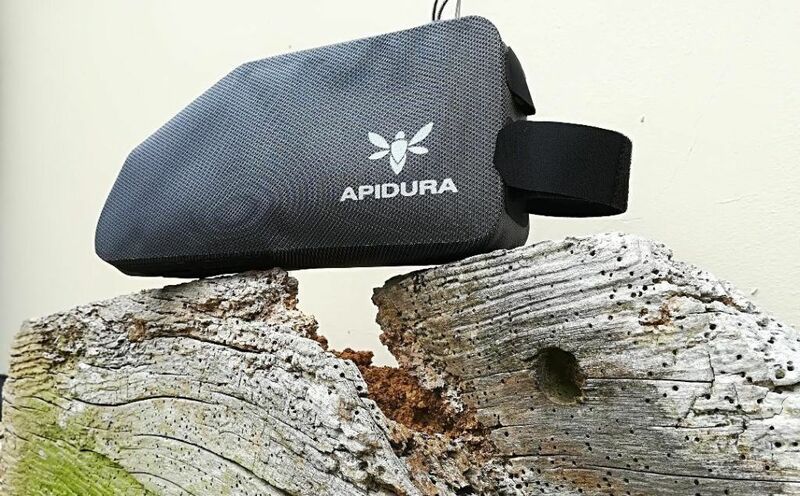 The Expedition series is Apidura’s all weather range. This is the waterproof iteration of their top tube bag. Sadly, it has arrived just in time for the sun to come out! The bag is an understated, mid grey. Branding details are in silver and that’s about it. Otherwise it is discrete and anonymous. The fabric is a “tear proof, lightweight and waterproof laminate”. 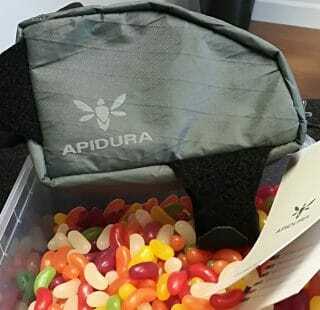 Apidura have used Hypalon in high stress areas. The headtube strap is welded on whereas the top tube strap is adjustable. This means it is threaded through one of two (Hypalon) slots. I understand the rationale but I usually end up losing detachable straps. I must have a drawer full of them, all waiting to be reunited with their respective bags! Working around the bag, you come to the zip or “waterproof closure” as the designer called it. The normal, easy to use, tag is hooked up to the smoothest (not a) zip I have ever used. There are no metal parts in sight, simply a plastic/rubberised section which closes tight to create a waterproof seal. I submitted the bag to our dreaded shower test. It was filled with tissue, and subjected to five minutes in the shower. Arguably more intense ‘rain’ than you would ever experience on the trail. At the end of the test, the tissue was as dry as when it went in. I’d be pretty happy to say it passed with flying colours. Finally, there is a protected cable port allowing you to charge equipment on the go without water seeping into places it should be kept away from! Inside, as you would expect, the lining is yellow, making it easier to find stuff in poor light. The lining is very soft, to protect your phone or GPS screens. However careful you try to be, any bag will soon accumulate sand and grit inside it. This naturally compromises the ‘screen protective’ qualities. Not so fast! 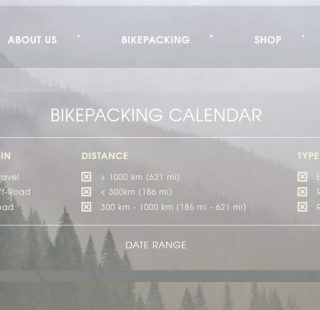 Apidura have thought of that. The lining is removable and washable. If your iPhone gets scratched, it is down to you! Bags are available in 0.5L and 1L volumes and retail at £42 and £47 respectively. 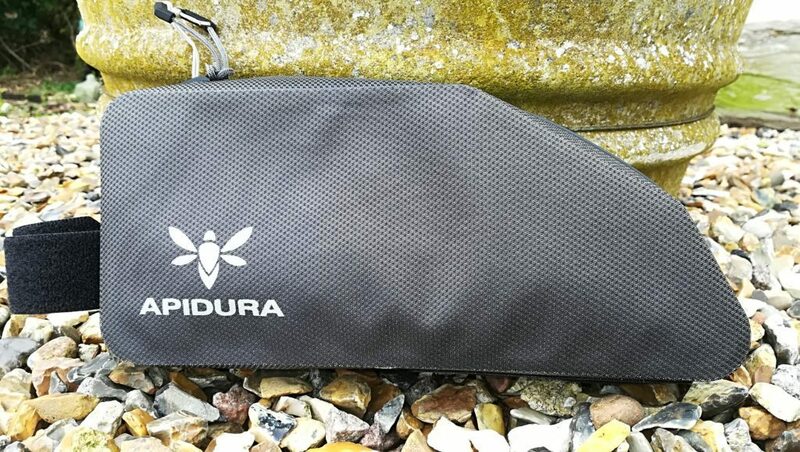 From the looks of things, this bag has been built up to Apidura’s consistently high standards. However, I am worried that the supplied velcro straps may not be ‘sticky’ enough for prolonged use in the wild! I had problems securing the bag to skinny steel tubes. It just wanted to flop about when loaded up. My Bokeh is out of order for the moment so I don’t have any bikes with oversized top tubes. I have therefore handed the bag on to Nigel who will put it through its paces.